Shifting Sands Theatre Company present Gogol's comedy of stupidity, corruption and greed. Supported by Arts Council England. The Mayor is in a cold sweat. News has reached him of an imminent investigation by a high-ranking government official who is travelling incognito – The Government Inspector. The officials in the small town are thrown into a panicked frenzy. They waste no time to cover up the misdirected contracts, the bribes, fiddled expenses, abuses of office … corruption that has been going on for years! A simple case of mistaken identity leads matters to spiral hysterically out of control when they believe that a stranger in the town is the real Government Inspector! Dubious political dealings, mishandled money, bribery, political panic – sounds familiar? 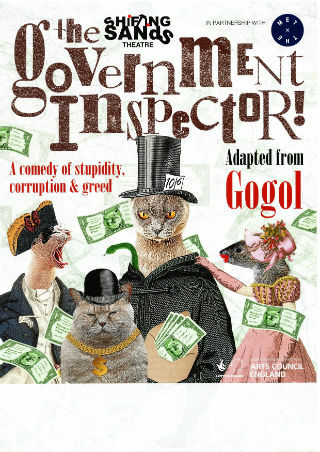 The Government Inspector written in 1835 by Gogol is an hilarious satire about corruption in a world where everyone is increasingly desperate to hide their wrongdoings and keep the supposed Government Inspector happy. Shifting Sands update Gogol's satire using recent events and scandals to bring contemporary relevance to the show creating an irreverent, accessible comedy rich in clowning and physical comedy.